For users of the ECAD Import Module, COMSOL Multiphysics® version 5.3 includes a new tutorial to demonstrate how to prepare an imported geometry for meshing and physics definition. Learn how to import data from an ODB++® archive to generate a geometry of a printed circuit board (PCB). The instructions detail how to find and remove small details from the geometry, create a mesh, and use automatically generated selections to define physics and mesh settings. The imported copper and dielectric layers of the PCB featured in this tutorial. The file is provided courtesy of Hypertherm, Inc., Hanover, NH, USA. 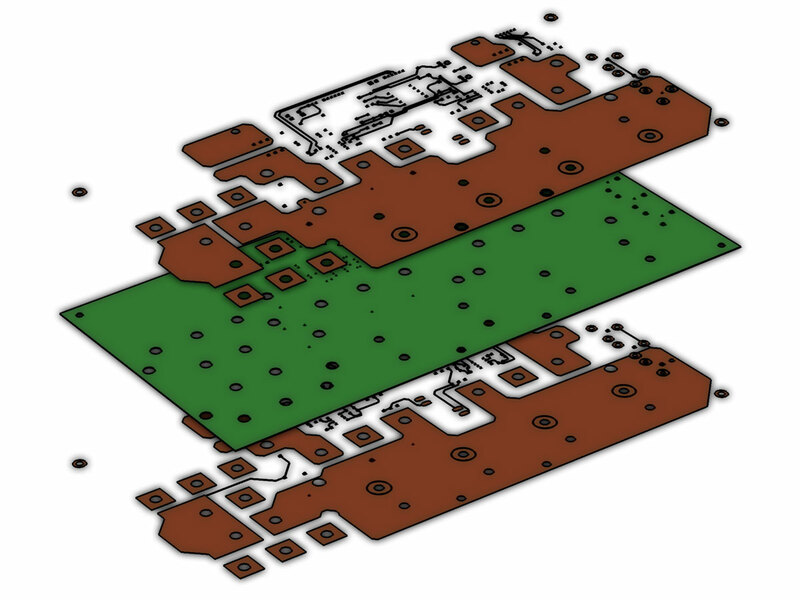 The imported copper and dielectric layers of the PCB featured in this tutorial. The file is provided courtesy of Hypertherm, Inc., Hanover, NH, USA. Support for implementation of the ODB++ Format was provided by Mentor Graphics Corporation pursuant to the ODB++ Solutions Development Partnership General Terms and Conditions http://www.odb-sa.com/. ODB++ is a registered trademark of Mentor Graphics Corporation. COMSOL AB and its subsidiaries and products are not affiliated with, endorsed by, sponsored by, or supported by this trademark owner.